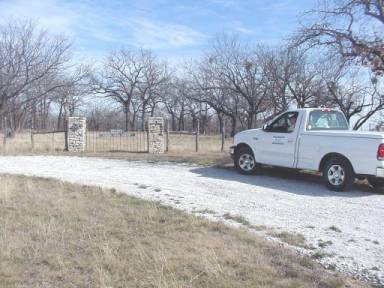 Hood County's The Colony Cemetery has been designated a Texas Historical Cemetery. The historic black cemetery dating back to the 1870s is apparently the first cemetery in Hood County to be designated as a historical cemetery, said Hood County Historical Preservation Committee member Karen Nace. Other county cemeteries have historical markers, but not the historical cemetery designation, she explained. The designation protects the cemetery under state law, Nace stated. The designation shows "the importance of The Colony Cemetery to Hood County," Nace believes. A ceremony will be planned soon to celebrate the historical designation, say supporters. An application has also been made for a historical marker for The Colony Cemetery, she said. The marker will be placed on 377 West at the roadside park between Tolar and Granbury, supporters say. The Colony Cemetery will be the focus of attention on Saturday, June 19. That's when the second Juneteenth celebration will be held at the newly-restored cemetery, said The Colony Cemetery Committee treasurer Ricky Pratt. Juneteenth is when blacks in Texas learned they had been freed by President Abraham Lincoln's Emancipation Proclamation in 1865. Before the first newly-revived Juneteenth was held at the cemetery last year, it had been 60 years since the day was marked at the site. Descendants of The Colony's residents are expected to come from Fort Worth, Dallas and other parts of Texas for the June 19 event. The cemetery is on County Road 103 (Colony Road) off U.S. Highway 377 West between Granbury and Tolar. A barbecue plate lunch will be part of the Juneteenth celebration, Pratt said. Renowned city of Granbury chef Keith Callahan is in charge of the cooking, he stated. Participants will find entertainment in games like horseshoes, cards and dominoes, Pratt said. They're also urged to bring lawn chairs, sun block and insect repellent. The gate on Colony Road will open at 9 a.m., with lunch from noon to 2 p.m. A donation will be requested for the lunch, said Pratt. Tents will be erected to protect visitors from the June heat. Volunteers are being sought to help set up for the Juneteenth celebration and do the clean-up afterward, Pratt stated. A volunteers' meeting will be held at the cemetery on Friday, June 18 at 5 p.m.
At one time, The Colony was home to some 400 residents, many of them former slaves. Its residents played a major role as farm laborers and stonemasons in Hood County. However, by the end of the Great Depression in the late 1930s, most of the residents left The Colony and moved to Granbury and other area cities. Very little remains of The Colony today. The 1-acre tract where the old church and school once stood only shows signs of the fire that destroyed the structure. Steps to a few of the old homesteads can be found among the weeds. The major landmark of the community is The Colony Cemetery, which contains graves that date back to 1876 and possibly earlier. In its heyday, familes in The Colony grew cotton and corn, with each family having its own garden and orchard. Juneteenth was celebrated on the creek behind the farm of the community's founder, former slave Simon Hightower. The women spent days baking pies and cakes for Juneteenth, said oldtimers. The men butchered hogs, steers, sheep, goats and chicken for the feast. There were barrels of beer and sometimes a still to provide corn whiskey for the celebration. The festivities kicked off at noon on Juneteenth and lasted until the food was gone. Sometimes there were 200 to 300 persons at the celebration, coming from nearby Granbury, Stephenville, Fort Worth, Cleburne, Weatherford and Annetta. In March 1997, a group of about 100 volunteers worked to clean up the cemetery, which had been neglected for over six years. After R. D. Edwards, the cemetery's caretaker, died in 1991, the cemetery was overrun by nature. Edwards was the great-grandson of Simon Hightower. Today the cemetery is marked by a new fence and native limestone stone pillars for its gate.